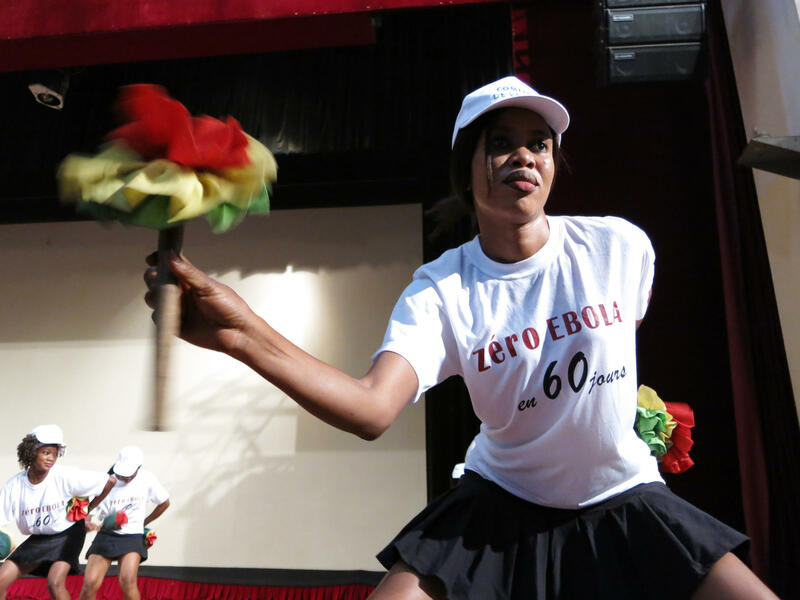 Cheerleaders with pompoms helped kick off a government campaign to eliminate Ebola from Guinea in 60 days. The number of new Ebola cases has fallen in Guinea, where the outbreak began a little more than a year ago. In the first week of January, the country reported only 42 cases — its lowest weekly total since mid-August. And schools there reopened Monday. Now the Guinean government has its eyes set on becoming Ebola-free by mid-March. Days before the rally, the prime minister warned that those who continue to hide Ebola-infected patients or try to secretly bury Ebola victims could face prosecution. He said the stubbornness of some Guineans, coupled with continuing doubts about Ebola's existence, had slowed efforts to eradicate the virus. "No to denial. No to rumors causing the loss of life. No to hidden Ebola patients. No to secret and unsafe burials. Examine your conscience!" Ebola czar Sakoba Keita told the crowd. "We must stop the chain of transmission. If we respect these guidelines, we will finish with Ebola. We must mobilize." In September, eight members of a team trying to raise awareness about Ebola were killed by villagers in Guinea's southwest. Periodic attacks on health teams — villagers believe they're spreading the disease — have taken place. The atmosphere at the People's Palace was upbeat as government officials took the stage to launch their new initiative. There was loud applause when the Ebola czar announced there were no more reported cases in Gueckedou, the original epicenter of the outbreak in the forest region. But pockets of transmission remain all over Guinea. "We've seen certain communities declared Ebola-free for the past 21 days here in Guinea, in the forest area, an area that was completely on fire months ago," says epidemiologist Benjamin Dahl, who leads the Centers for Disease Control and Prevention's response in Guinea. "So we know it's possible and we just need to make sure that those learned lessons and best practices are applied here in Guinea and every last area where we have cases." Dahl hopes that the new initiative will reinvigorate the country's response to Ebola and motivate Guineans to remain vigilant in the coming months. "It might take a little longer than 60 days," he says, "but I think this is really going to inspire the country of Guinea." The crowd falls silent as a bugle sounds a solemn tattoo for the almost 2,000 people who've died of Ebola in Guinea. Community leaders pledge to make zero a reality. "Schools are reopening, and we want our children to be safe," says Hadja Adama Camara, who heads the road sweepers' association in the Conakry neighborhood of Kaloum. "We are going to fight even harder than before against the Ebola virus. The government says zero Ebola cases within 60 days. We hope it will be within 30." But as health officials at the U.N. have stressed, Ebola is a regional problem. That means Guinea and neighboring Sierra Leone and Liberia must all hit zero, before West Africa can say it has shaken off the Ebola epidemic. People who are risking their lives to confront the Ebola epidemic will tell you they take signs of progress with great caution. Margaret Chan, head of the World Health Organization, said on this program in the fall that her organization was caught off guard by the enormity of this outbreak and that much uncertainty remained. Still, today, the WHO is taking note of what it says is important progress. Liberia has registered its lowest weekly total of cases since June. Sierra Leone has reported a decline for the second week running, and in Guinea, where the epidemic began, the number of cases has also fallen. Schools in Guinea are set to reopen today after being closed since the summer. From Guinea's capital, here's Ofeibea Quist-Arcton. OFEIBEA QUIST-ARCTON, BYLINE: Music, fanfare and Guinea-style cheerleaders with pom-poms welcome government officials and hundreds of participants for the launch of the Zero Ebola Cases in 60 days campaign at the People's Palace in Conakry. Guinea's Ebola czar and the prime minister, Mohamed Said Fofana, kicked off the new government initiative. PRIME MINISTER MOHAMED SAID FOFANA: (Through interpreter) Guineans talk too much. People resist even the idea that Ebola exists. This disease kills. How do we overcome denial that Ebola exists? Why do we refuse to accept what others have accepted? We really must get a grip on the situation. QUIST-ARCTON: Days earlier, the prime minister warned that those who continue to hide patients sick with Ebola, or try to hold secret burials of Ebola victims, could face prosecution. He said the stubbornness of some Guineans, coupled with resistance about Ebola's existence, had slowed efforts to eradicate the virus. Ebola chief Sakoba Keita echoed the same theme. SAKOBA KEITA: (Through interpreter) No to denial, no to rumors causing the loss of life, no to hidden Ebola patients, no to secret and insecure burials. Examine your conscience. We must the chain of transmission. If we respect these guidelines, we will finish with Ebola. We must mobilize. QUIST-ARCTON: In September, eight members of a team trying to raise awareness about Ebola were killed by villagers in Guinea's Southwest. Periodic attacks on health teams continue. Suspicion and fear persist in Guinea, where the Ebola epidemic began just over a year ago. QUIST-ARCTON: There was loud applause when the Ebola czar announced there were no more reported cases in Gueckedou, the original epicenter of the outbreak in the forest region. But pockets of transmission remain all over the country. Leading the team for the Centers for Disease Control and Prevention in Guinea is Benjamin Dahl. He says there's been progress. BENJAMIN DAHL: We've seen certain communities declared Ebola-free for the past 21 days here in Guinea in an area that was completely on fire months ago, so we know it's possible. And we just need to make sure that those best practices are applied here in Guinea, in Conakry and in every last area where we have cases. QUIST-ARCTON: A moment's silence, and the bugle sounds a solemn tattoo for the almost 2,000 people who've died of Ebola in Guinea. QUIST-ARCTON: Community leaders, including the head of the road sweepers in a Conakry neighborhood, Hadja Adama Camara, pledged to make the zero cases within two months target a reality. ADJA ADAMA CAMARA: (Foreign language spoken). QUIST-ARCTON: Camara says schools are reopening, and they want their children to be safe and not to be infected with Ebola, so she says they're to fight harder than ever to end the virus within 30, rather than the government's goal of 60 days. But Guinea and neighboring Sierra Leone and Liberia must all hit zero before the region can say it has shaken off the Ebola epidemic. Ofeibea Quist- Arcton, NPR News, Conakry. Transcript provided by NPR, Copyright NPR.